Healthy, vibrant skin is a vital component of overall health and gives you extra confidence in everything you do. Keeping your skin healthy is a challenge for most of us – especially if you are having problems with breakouts, excessive oil, dry scaly patches, blotchy coloration and black heads. To resolve these issues your skin deserves dedicated professional attention. After discussing your concerns and goals as well as performing a thorough skin analysis, a custom skin care solution plan will be developed for your unique needs that provides long lasting benefits. Special: Prepay for 5 treatments and get the 6th one FREE! Cancellation/No Show Policy: Please allow a 24 hour notice when canceling or rescheduling an appointment to avoid being charged. 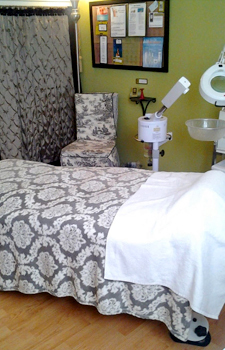 Microdermabrasion is a noninvasive, nonsurgical procedure used to revitalize and rejuvenate the skin. The device gently pulls the skin into a hand piece by mild suction which initiates the controlled flow of corundum particles. Dirt, oil, surface debris, and dead skin cells are removed by the impact of the particles on the skin’s surface. My dull, dehydrated and congested skin is now glowing and vibrant thanks to regular facials at Lisa Crosier Skincare. Thank-you Lisa.